When we moved here I gave up the lovely workshop that I'd built at our last place. So to house all my "big" carpentry tools and the other things we'd need for a smallholding, we brought a shipping container until we could build something better. Painted green and the with the ceiling insulated inside, its the perfect secure store. I then went for planning permission to build a barn, this would have provided me with space for storage of things like hay and straw (and a tractor) as well as giving me somewhere dry to work. I got turned down - my own fault I think as it was probably too big for the area, although i had no complaints from the neighbours the council had the final say. But now with my homemaker duties coming up in a few months, I could really do with a small workshop to make things in the evenings to sell (when the kids are in bed). So as a temporary measure I'm considering getting another container - this time an office type one so it will be ready insulated and have windows to provide some natural lighting. I like the place looking nice but sometimes you have to be practical as to what best suits your situation. unless anyone has got any other ideas on what I could do for a temporary workshop in the mean time? I was tidying up in the veg garden at the weekend when I came across these little fellas hiding under some weeds. This made my mouth water, I love beetroot. Hopefully I think I might have talked my wife into making one of my favourite dishes this week - Beetroot Tart Tatin. Crumbled with feta cheese on top and served with mash its meal that really doesn't need any meat. If you want to make it the recipe we use is from River Cottage and can be found here. I love beetroot in every form! Or as it affectionately gets called by my workmates "Gay Tea". 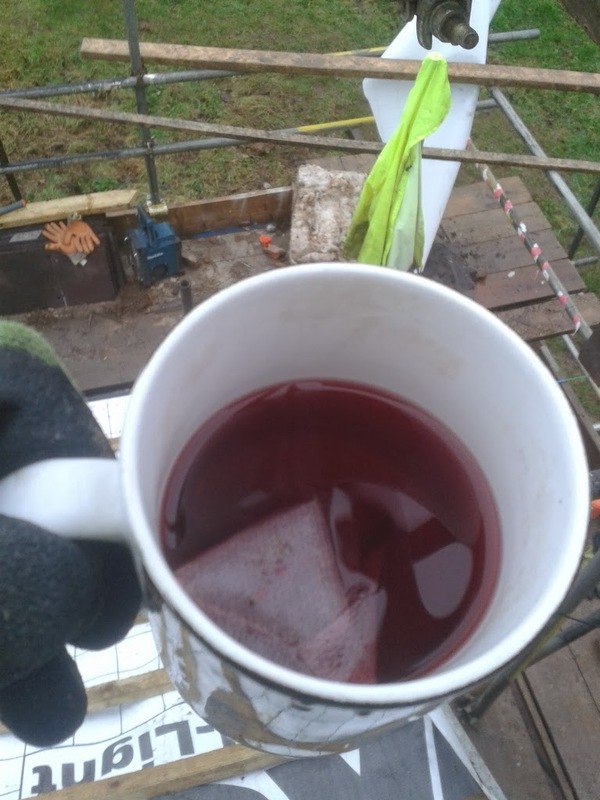 I'm not your usual builder -I don't drink tea or coffee. In fact I've never drunk a full mug of either. Most of the year I just drink water. But when it's cold and your working outside you need something to warm you up. I settle for a fruit tea. I get a lot of stick about my choice of drink (not helped by the fact it says "Fresh and Fruity" on the front of the box) but I really enjoy them and I don't think I would have survived working on a roof the last couple of weeks without them! But I'm always on the look out to cut costs or try something else, so I wanted to ask if anyone makes their own from scratch and does it cut it when compared to the ones you can buy? If it does give me the recipe or link and I'll try it! With my role changing in the Spring to full time homemaker, part time carpenter, we're really struggling with what to do with vehicles. We both need a vehicle as we're quite far out from the village and even further from the town. When I'm not working I want the children to go to play groups, grandparents houses, etc and these will all involve driving and my wife's work is 45 minutes away. 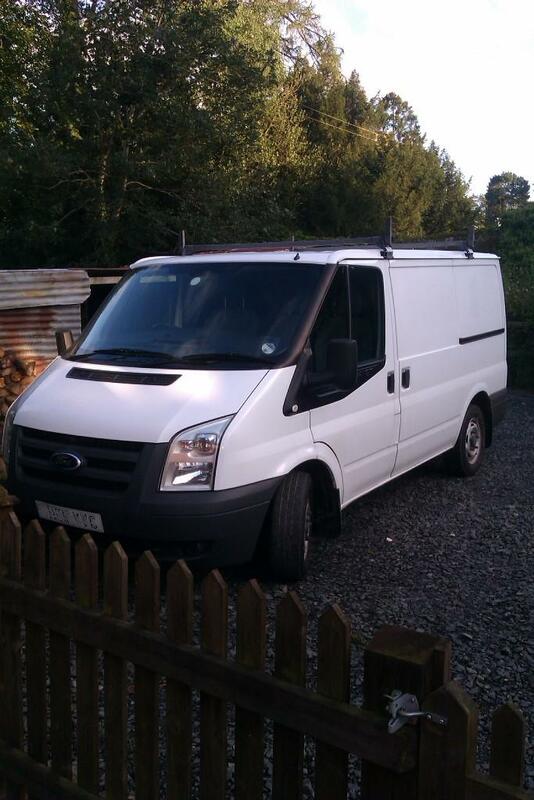 Currently I have a transit van, which is about the minimum sized van I can get away with to do the type of work I do (I've had smaller vans but it never works out very well). 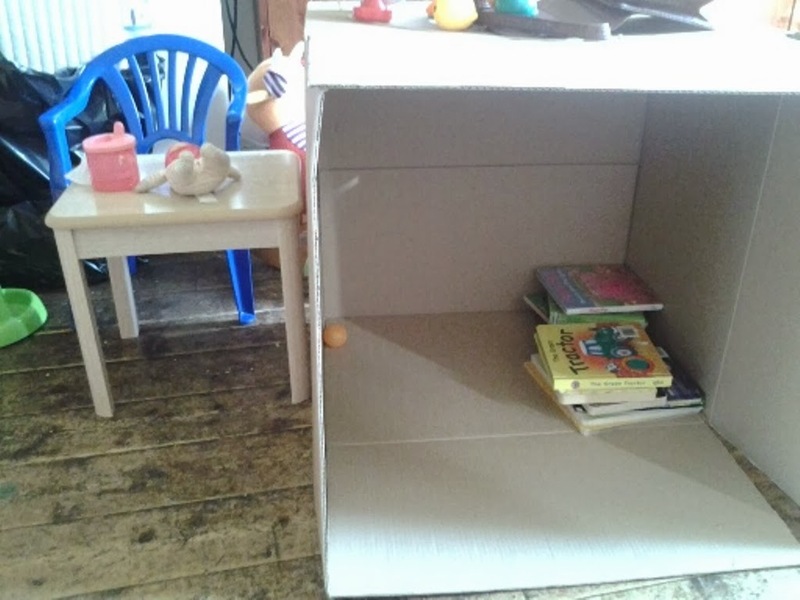 I plan to continue doing my own private work for customers at weekends and school holidays and also it's handy having something like this for a smallholding where I can pick up large items (hay, straw, feed etc). The van has three seats in the front so me and the girls do fit in it, the trouble is it's expensive to run and drinks the juice. My wife has an estate car, which is ideal for the children, fits all the stuff she needs for school in and is quite economical to run. We also have (and are trying to sell) a small Skoda Fabia, my wife's old car. This is cheap to run and is a good runner. My wife has suggested that we keep all three as it would be better if I had the estate car (as I'd have the children all the time), she kept the Fabia for going to work and I only used the transit for when I've got work (to keep fuel costs down). The trouble is I don't like the idea of paying to keep all three vehicles on the road. I often get tips for the work I do, but this week dad gave me half of one of his - A 25kg bag of organic carrots. I certainly wasn't going to turn down half a potato sack full of carrots! When we gave Ev her new kitchen for Christmas we used the distraction to "remove" her old favourite toy before it fell to pieces. 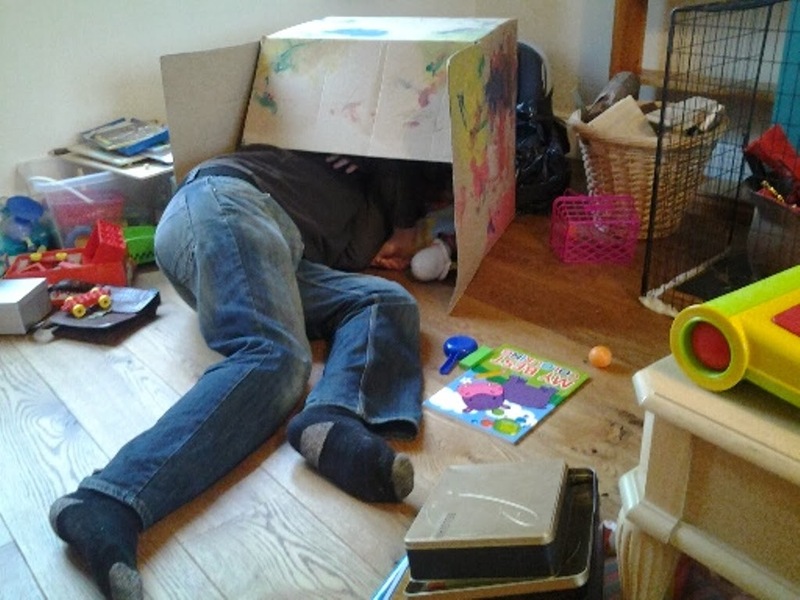 That's right, you guessed it - a cardboard box. It was her library, her house, her hiding place even a piece of modern art once she'd painted it! And of course I had to go round for some tea sometimes, you were privileged to get invited in - even if you didn't fit! I think children know that sometimes the best presents are free. This box gave her around 6 months of joy until it started to fall apart and now it's a mulch on the veg garden so it lives on a little longer yet! 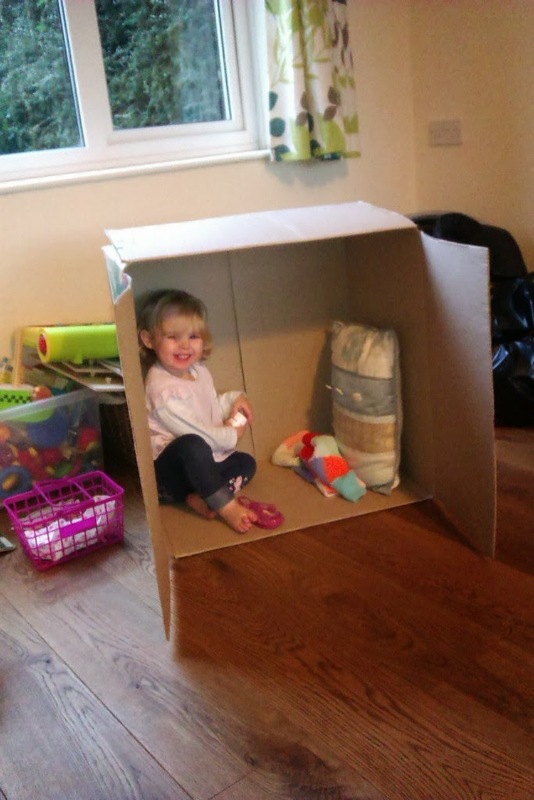 I think that's proper recycling of a cardboard box! In the corner of the bottom field there's what looks like an old gateway that's been fenced over. It can never really be used as a gateway again as there is now a telegraph pole and straining wire in the way. I decided that with the left over plants from the top hedge, to patch over this gateway and make it so that people couldn't climb over if they wanted to. 26 hawthorn plants later, along with some bamboo and tree guards and the jobs done - I got soaked in the process! I'm not sure how well these plants will do as they're shaded by the big oak tree above them. The rest of the hedge was planted a long time after the oak and they've grown OK so hopefully these young plants will survive. Anyone else been patching they're hedges lately? The estate where I've been working on Saturdays has the most amazing toilet for the workers! There's no door, but then as you sit on it and look out, there's no one who can see you. I just love this view! Now where's the paper? I love this toilet for all its rustic charm (never thought I'd love a toilet). I seem to be on a fencing rampage at the moment and every spare moment (in day light) is spent trying to get the fields fenced. In between the bottom field and the orchard there's a large, over grown willow growing in a boggy bit of land. Where I grew up, they'd call a willow tree like this is a "Sally Tree" which I guess comes from it's Latin name salix although I doubt too many could tell you if it had or not. I've also heard it called a crack willow due to how the branches break with a crack. Willow trees are notorious for growing fast in wet boggy ground and they're ridiculously easy to root. In fact in the old orchard where I grew up they staked every tree with willow posts (the people who had the land before dad) and most rooted so there's a lot of half apple - half willow trees about the place, although I think the willow is taking over slowly. Dad came to help yesterday - managed to get him to pose for a photo! To get the fence across this bit of field I had to - to use a technical term - "hack it back a bit". Any other tree I possibly wouldn't have been so chainsaw happy with, but I know this willow will come back in leaps and bounds with lots of whippy new growth at the ends of the branches I've cut. I need to tackle the other side of this tree at some point, as it keeps spreading further and further into the orchard, but at the moment this bit of a hair cut lets us get the posts in and gave me a bit of (not very good) firewood for the fire and a pile of brash to sort out. Anyone else have any local names for willow trees? With my full time homemaker job role approaching in the spring I'm always on the lookout to save money, and I managed to save a few pounds this week with some old posts. Ken, one of our next door neighbours, was ripping out a section of fencing on the boundary to our field (not our fence though so we don;t have to pay for it) to replace it with new, higher fencing, that would keep in the mad boxer dog Jilly. The old fence post broke off at the ground, rotten where they were in the soil, but otherwise sound. The only trouble was they were destined for his bonfire. I intervened. 10 minutes with the chainsaw and they all had new points added to them. Voila! 11 new fruit tree stakes. They'd be no good for fencing now, too short and not really a big enough diameter, but they'll easily last the few years they're needed to support a fruit tree and as I'll plant a few more this winter it's saved me a bit of money. Anyone else got a use for old fence posts? My sister is a rather clever with textiles and loves making things. 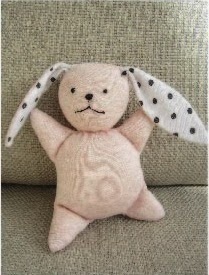 She's just written a blog post on a rather lovely squidgy rabbit she made for my youngest daughter when she was born. Check out her blog here for pictures of this little bunny with my little girl! My new batch of hens have got everything they could ever want, a nice big coop, a fresh patch of grass, bedding and plenty of food and water. Why then are they only giving me a few eggs if I'm lucky? I think I know the answer to this one - egg eater. I'm pretty sure the eggs are being eaten by a bad hen. The harder question is how to stop it. My wife is going to check and collect the eggs a couple of times a day to lessen the time they're in there. I've added in some ceramic eggs which won't break to fool them into thinking they can't break them and I've added loads of bedding for the nest boxes so the eggs are snuggled down into it. I'm considering interviewing them one by one, with an egg on the table, and any that go for it will be sentenced without trial (on bin day). Any other suggestions from fellow chicken keepers before it gets to this? My "big" order of fruit tree rootstocks has arrived. For me this is quite a big order of 100 MM106 apple rootstocks, 15 Quince A rootstocks, 10 "gisela 5" cherry rootstocks and 15 plum root stocks. I have heeled them into the veg garden to leave until the end of winter when I'll graft them. The only trouble is I ordered a little scion wood to go with the order (Apricot and a couple of different plums) and I'm not sure the best way to store this until March. Some research needed unless you guys have some advice? I've got a lot of books on smallholdings and homesteads but this is the first one I've read from a fellow blogger. It's written by Leigh Tate who has the blog "5 Acres & A Dream", its a blog that I visit regularly and I enjoy seeing what she and her husband do with the same sized piece of land over in the US. The book is well written, easy to read and broken into sensible chapters. Certain things in it have really given me food for thought - seeing things like how their master plan changed through the years of being there made me wish I'd drawn up more definite plans for here on paper so I could alter them as ideas and needs change. One chapter I really enjoyed was about food self-sufficiency for animals. This is something that most books skip over, but if you really want your own patch of land to completely support you then it's no good bringing in feed for the animals the whole time. And although they've no where near cracked it in terms of animals feed she shares all their failures and what they're planning to do next. The book isn't a "how to" or a "guide" but more of the story of how they came to be in the position they're in and the way they are tackling each issue of self sufficiency. I could see that Leigh has a same kind of approach to self sufficiency as I do, whilst still paying the bills and mortgage, and I guess that's part of what makes it so appealing to me. If you enjoy her blog, then you'll enjoy this book. Over the Christmas break I managed to get our new hedge planted. This was to be 42m of hawthorn with a few home grafted cider apple trees spaced amongst it. The first thing I did was to make sure that we had all the posts in for the fence that would go either side of it (I'll do a how-to fencing post later in the month). Having these in first would mean than no plants would get damaged as we go about bashing the posts in. I then planted the cider trees in the middle spaced at about 5m. I then spaced out the 225 hawthorn plants evenly, it worked out at about 5-6 per meter. I laid a bundle of 6 plants every meter and that way as I worked down the hedge I knew I was planting at the right spacing. I planted in sections, planting around 5 meters then going back and adding bamboo canes to each plant and then adding the rabbit collar over the top of them both. By doing it in sections I could see that the spacing was right and it broke up the monotony of the job. Seems like a long way! Using my foot to push the earth back around it. Now repeat 225 times! It took me most of the day to plant it and although it's not nice work (standing up was a treat!) I got a real sense of satisfaction when it was finished. I've still got to add two more apple trees and an oak tree on the far left before it's finished and I've also kept some hawthorn back to plant in a nursery bed to replace any plants that die over the next 12 months. My main concern is that it's in a really wet part of the field so some of the roots might drown but hopefully it will be alright. Anyone else planted a hedge from scratch? If so how did it go and how long before it really looked like a hedge? Happy New Year from our little homestead! I'm really looking forward to seeing what the next 12 months brings us. There's going to be some interesting times ahead - with me taking on the full time childcare, becoming more self sufficient/reliant, trying to grow as much food as we can, getting more livestock for the homestead, starting to build an extension for the house (doing as much as I can myself) and try to make a small amount of money from the land. I hope you all keep reading and commenting in 2014!